Image: Adam's photo lab. 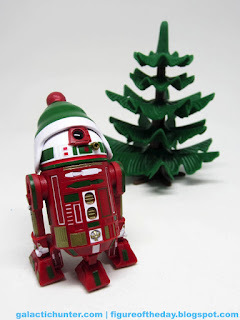 That's a Playmobil tree in the background, you can find it in numerous sets. Mine came from 5898. Commentary: Second in a series of holiday droids, R2-H16 throws the idea that these will be an annual souvenir on the table. Last year's came with a Santa hat - this year has a more traditional winter hat, despite the Christmas colors. A red droid with white outlines plus gold and green trim screams "Christmas" in a way that's hard to ignore. 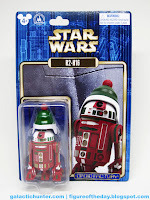 The same Disney R2 astromech droid is back with no obvious changes - the same hole in the dome is here, the same wireless feet are here. If you haven't yet accepted that this is Disney's way of pushing a Vinylmation-style line on action figure collectors, you might want to get used to the idea. 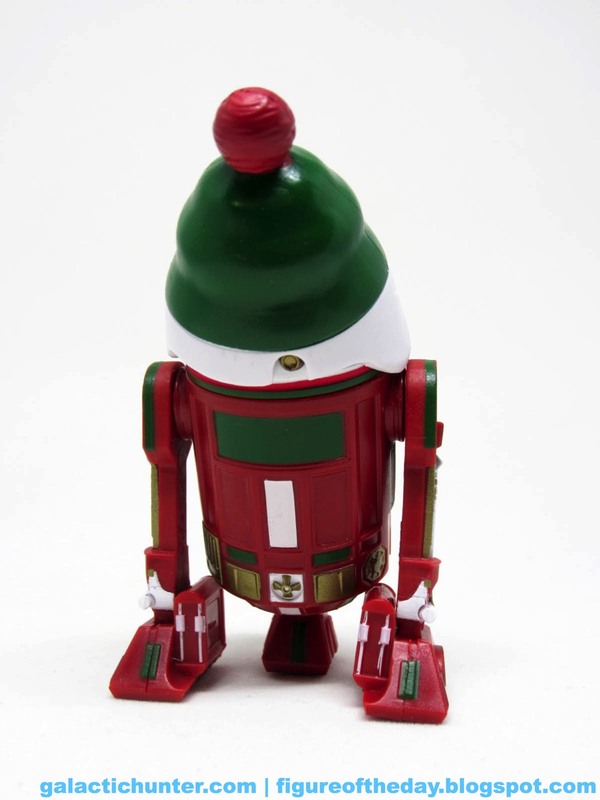 The green hat with white trim and a red ball is new here - it's not in the bins as of this figure's release, although the Santa hat last year eventually made the bins. 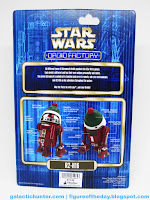 As such, I'd expect it to show up sooner or later, or with the next batch of build-a-droid parts. The last batch was right around the time of the last movie, so we really haven't had any in 2016. I'M OK with this. The hat fits perfectly well on the R2 dome, with a little cut-out in the back so it fits over all the projectors and parts. 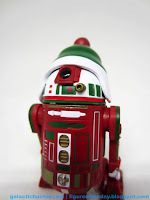 The droid itself has a Snowman-esque deco with a white dome and trim in standard Christmas colors - red, green, and gold. It's pretty clean, with a glossy black central eye. The trim really does a good job of making the dome - and body - pop nicely. 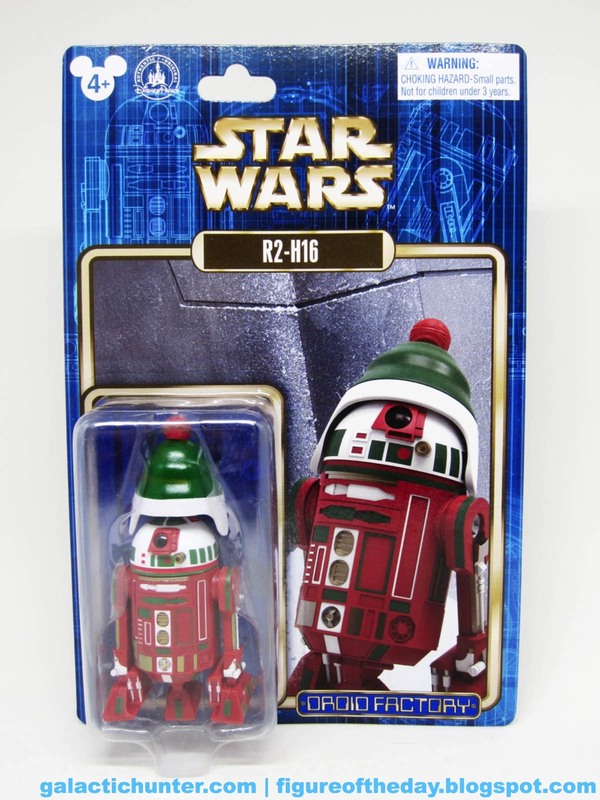 If this weren't a brand-new holiday toy, I'd assume this was some weird refugee from a Hallmark store in 1988. Minus the fact that Star Wars couldn't have been more out of vogue at the time, that is. 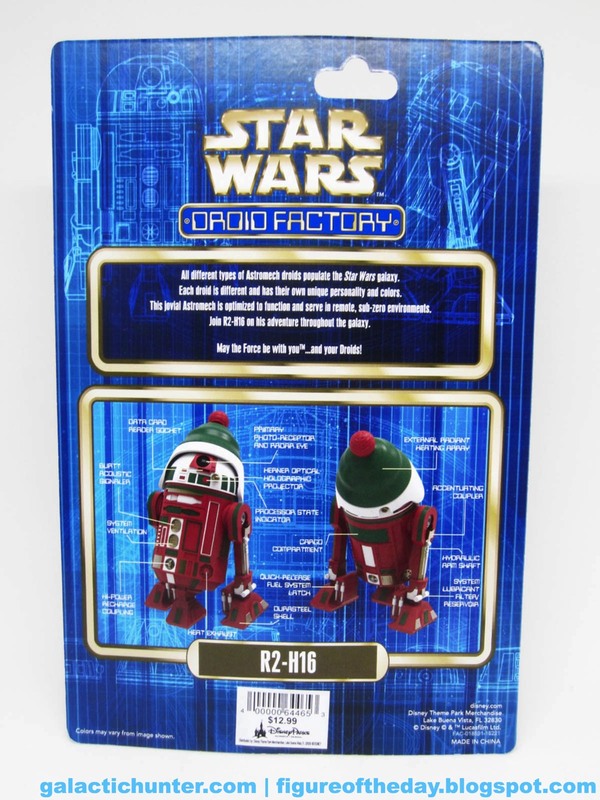 Since it's a unique droid with a cool hat, I'd say go get it - but it's completely out of the narrative, and has nothing to do with the movies or stories. The figure exists to be the figure, and as such you can skip it without feeling that you missed much. I can't, because I'm crazy, but you have that option. Collector's Notes: I got mine from Disneyland courtesy of my pal Shannon. Thank you Shannon!